Can Understanding Ageism Promote Longevity? According to a researcher at Umeå University in Sweden, attitude can make a big difference when it comes to aging. In a study published in Nordic Psychology, Dr. Fredrik Snellman suggests that a more positive attitude toward aging may help Oshkosh at-home care providers and their loved ones live longer, more pleasant lives. Furthermore, Snellman asserts that the word “ageism” itself is a form of discrimination because it often makes people think of only elderly people. It is his belief that redefining this word may promote longevity. Ageism, a term coined in 1968 by Dr. Robert Butler, encompasses three aspects: prejudice toward aging and aged people, discrimination against the elderly, and policies that reduce opportunities for older people. According to Snellman, the very term perpetuates an attitude of “us versus them.” He says that ageism should instead be portrayed as important to people of all ages, as we all use age as a basis of making sense of our society and organize our lives. Snellman argues for the adoption of new terms to describe the aging process, citing a 2002 study that found people with negative attitudes toward aging live an average of 7.6 years shorter than those with more positive feelings about getting older. “Age-related indifference does not suddenly appear when we grow old. It appears gradually and in different ways at all ages,” Snellman said. Society tends to characterize aging itself as a negative event. We often see aging as being linked to decrepitude, and that at a certain age, an individual ceases to be a functioning member of society. Linking age with capacity is a central component of ageism at any age and it contributes to problems not only for the individual but also within the family. Caregivers and family members can fight harmful ageist attitudes by avoiding the mental trap of assuming an aging loved one’s problems are just “part of getting old.” Remember that people of any age can enjoy life and contribute in some way. Avoid selling a loved one short by succumbing to ageism. 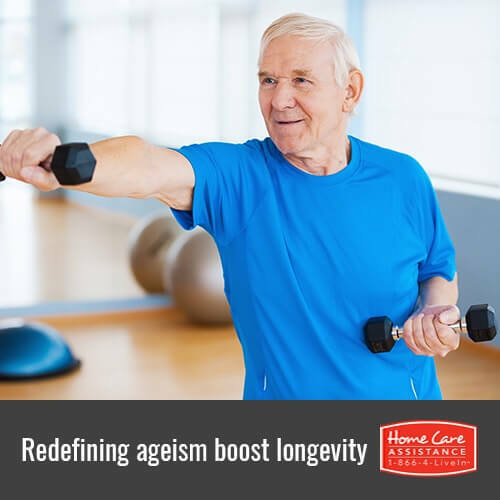 You can further promote senior longevity by turning to Home Care Assistance of Oshkosh. We provide numerous services including stroke, dementia, and Oshkosh Alzheimer’s at-home care to help seniors meet the challenges of illness and injury in the comfort of home. Our experienced caregivers help seniors with everything from housekeeping and errands to personal care and companionship to ensure seniors remain as independent as possible during their golden years. Give your loved the support he or she needs to enjoy peace and longevity at home. Call us at (920) 710-2273 today to schedule a free in-home consultation.